Accelerate time to market and dramatically reduce costs with hybrid cloud. See how Cancer Research UK has done it with CenturyLink Technology Solutions. Off-the-shelf IT solutions aren’t a good fit for every company. They can’t deliver flexibility, agility and customization companies require. (Not to mention, they can rack up considerable costs!) 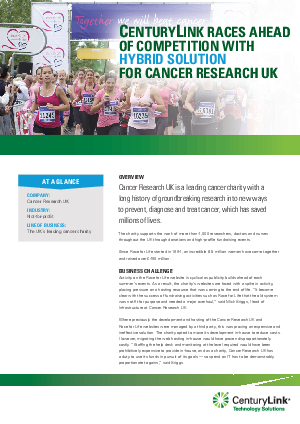 That’s why Cancer Research UK turned to CenturyLink Technology Solutions when it needed an affordable, hybrid cloud solution to bring its new Race for Life website to market. “With CenturyLink’s help, we managed to create a dedicated hybrid cloud, bundling the Race for Life project with other managed services for 50% less than the majority of other service providers were offering for the Race for Life website hosting alone,” says Mick Briggs, Head of Infrastructure at Cancer Research UK. CenturyLink was able to deploy a cost-effective, hybrid IT solution of dedicated cloud and colocation, allowing Cancer Research UK to continue to test and develop web applications and manage disaster recovery themselves, striking the perfect balance between in-house and third party solutions. Read “CenturyLink races ahead of competition with hybrid solution for Cancer Research UK” now, and see how hybrid IT solutions can speed you forward and increase efficiencies.